Monks & Crane have been satisfying customers for over 150 years and that history brings great strength in dealing with complex requirements whilst our 'Divisionalised' structure also brings experienced resources for customers. Within the divisionalised structure we work with suppliers who understand technical requirements & allow customers to see new product innovations from leading manufacturers. This allows Monks & Crane to offer a complete service solution and for customers to gain efficiencies within their purchasing & manufacturing processes. Our branch network allows us to reach customers all over the UK & Ireland with staff dedicated to serving the customer and with a product range exceeding over 300,000 articles across 25 commodity groups held at a central location we can supply anywhere from stock. If you would like to know more or simply wish to understand how we could work with you, please contact us. Monks and Crane product ranges have been created to reflect the requirements of today's industrial market. With our state of the art National Distribution Centre in Birmingham and branches across the UK, Monks and Crane offer next day delivery service on all our standard product lines. Our extensive product range includes the strongest Brands on the market ensuring we offer our customers the highest quality products available. Allowing organisations to focus their management expertise on core activity within their business, Monks & Crane provide a specialist outsourcing service that will integrate seamlessly into your business. Our experienced team, incorporate leading edge operational practices and the latest technology, to produce a supply chain solution to world class standards. 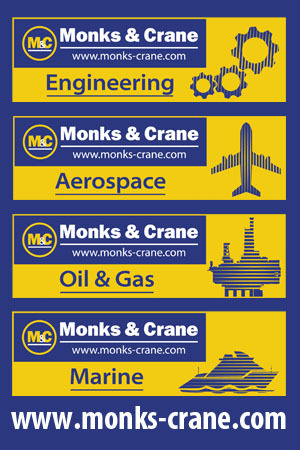 Monks & Crane has a proven track record within the industry, providing our services to a premium portfolio of customers from a range of market sectors which include; Aerospace, Food and Drink, Engineering & Leisure industries. A Monks & Crane integrated supply solution can provide the following benefits to your business.